The University Times, one of the student newspapers for Trinity College Dublin, has been embroiled in controversy over the use of a hidden recording device in a report into ‘hazing’ at a student society. After 500 students signed a petition protesting against the newspaper, the students’ union is holding a referendum on defunding the newspaper and stripping the editor of her salary. Hazing, also known as an initiation ceremony, refers to practices and activities to initiate a new person into a group, such as a society or club. These ‘rituals’ often involved humiliation, abuse and harassment of the new member, and can range from relatively harmless pranks to, in some cases, behaviour that would be classed as a criminal act. The practice hit the headlines in the UK last year following an inquest into the death of university student Ed Farmer, who took part in an initiation ceremony bar crawl. The newspaper, which won an award for best non-daily student newspaper by the Society of Professional Journalists in 2017, ran a story on hazing earlier in the year within the college’s rowing society, after speaking to students who had been subjected to abuse at initiation ceremonies. "That sent shock waves around the campus," explains Eleanor O’Mahony, editor of the University Times. "There was whipping, forced drinking, running around in underwear and taking clothes off." Following that story, she says she received a tip-off a few weeks later about an initiation ceremony taking place at an all-male ‘secret society’ on campus, known as the Knights of the Campanile. Given that the membership of this group is not common knowledge and knowing that it would be almost impossible to get a member to speak out about their experience, the University Times spotted the group gathering at a campus landmark and followed them to an accommodation building, where they could hear shouting coming from one of the rooms. "It was pretty obvious who was shouting and that this was definitely hazing," O’Mahony said. The team decided to enter the building and heard the commotion in greater detail. "A reporter with me had his dictaphone, so we said ‘We can hear everything, we’re just going to wait here and listen and we’ll keep this dictaphone here to back up what we’re hearing’, because we thought it was really important to have this evidence." They placed the device outside the door of the apartment and moved out of sight to continue to listen and note down what was going on. However, the device was found by members of the society and it prompted criticism over privacy, including from the college’s rival paper, Trinity News. In an editorial in Trinity News last month, Rory O’Sullivan and Niamh Lynch compared their behaviour to that of the now defunct News of the World, reminding readers that their scandal over ‘bugging’ resulted in the closure of the paper. 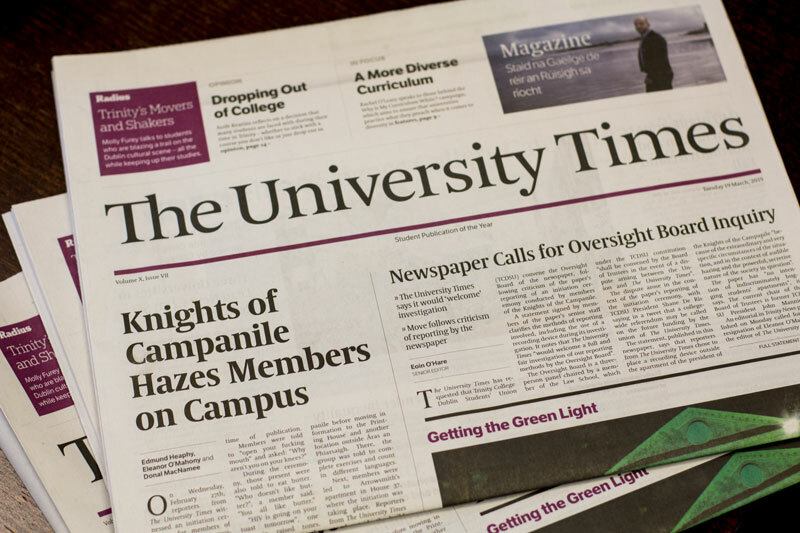 "Although their intentions were undoubtedly good, the University Times have breached any code of journalistic ethics worth the name," they said. "The editor’s position has become untenable. As long as they remain in their position and things continue as normal, the paper will be tainted by this scandal. Its integrity has been destroyed." O’Mahony explained that the claims that they had ‘bugged’ a student’s residence hit the team who had worked on the story hard. "That really did send waves of negativity around our reporting across campus. People were very angry about it. It was a huge blow to us, and to me personally, in the middle of our last production," she said. "Because the word ‘bugging’ has been thrown around so much, there’s such an implication with that word, that it was surveillance or that we were on a fishing exercise or that we were randomly recording things. "We were not using any methods of surveillance. No one is ever suggesting that we feel that we can record anyone’s apartment randomly. We went there that night with the express intent from a tip-off to uncover hazing, which we thought would be very important for people to know about." "If someone had questioned whether we had written the truth or not, which people have been questioning, I think the recording was a smart thing to do in that sense." Within a week, a group of 500 students signed a petition calling for the University Times to have its funding cut from an average of €18,000 a year to just €3,000, and for the editor to be stripped of her salary and on-campus accommodation. This prompted the union to hold a referendum, taking place this week, on defunding the newspaper. O’Mahony explained that the extent of the cut in funding would mean the paper would no longer be able to exist in its current form. "In one way, I’m disappointed that we have to have this battle at all," she said. "In another way, I’m happy to defend ourselves and make this wider point of press freedom and people see that they can’t do this and they can’t try and shut down a newspaper if they disagree with one article or the way we reported it." She also said that she has received a lot of support from students, journalists and also the National Union of Journalists, which she has been pleasantly surprised by. "I think people realise, whatever you think about the story, it’s a step too far to shut down a newspaper and especially one that’s been so successful and that has really served students well. So I think people are seeing that and I hope it will reflect in the ballot box. "I am quietly confident, but I’ll be holding my breath until the result." 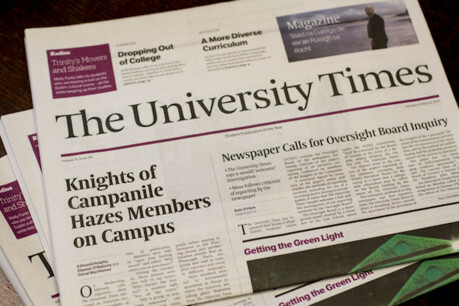 According to the Student Publication Association (SPA), a body for student newspapers and magazines across the UK and Ireland, the experience of the University Times is not an isolated incident. Conor Matchett, the chair of the SPA, explained that many student newspapers have reached out to the group facing threats of censorship from their union following a publication of an investigative story. "The worst thing you can do is set a precedent that, if there is a negative story, you should defund the paper rather than recognising the good work that student journalists do and providing them with the kind of resources to do it with." The Knights of the Campanile deny all the allegations made against them and, in a statement on their website, said: "It has been distressing for the student Knights to have been the subject these past weeks not only of the University Times’ irresponsible and sensationalist claims of ‘hazing’ but also of the ludicrous claims made by Editor of ‘appalling ritual humiliation practices." Since their piece calling for the editor of the University Times to stand aside, Rory O’Sullivan has published another editorial for Trinity News, which said that, despite the "gross ethical misstep" made by the paper, defunding the newspaper would be a "crude, senseless thing to do."